Paul Enenche, the founder of Dunamis International Gospel Centre, Abuja has exhibited tendencies which clearly certifies him as an apostle on assignment to help people discover, rediscover and recover their destinies. For a few uninitiated, destiny refers to divine- assignment ordained from the beginning of the world for a human being to fulfil. The Almighty God told prophet Jeremiah in Jeremiah 1vs 4-5, "Before I formed you in the womb I knew you, before you were born I set you apart; I appointed you as a prophet to the nations." Thus Jeremiah was set apart as a prophet even before he was born. John the Baptist was ordained as a' voice in the wilderness' announcing the mission of Jesus Christ long before his birth. In Isaiah 40 vs 3 ''The voice of him that crieth in the wilderness, Prepare ye the way of the LORD, make straight in the desert a highway for our God.'' Joseph's leadership in before Pharaoh in Egypt was preordained. Therefore, the subject of destiny is not a strange one. Everybody is set apart to perform one task or the other for the benefit of humanity. One of the problems of Christendom is that many people are doing what they are not called to do, that is why we preach about how Jesus healed the blind and lame, yet the blind and lame still abounds in the same congregation. This is because those empowered by God to pursue the path of divine healing are in private practice in the United States, Europe and other parts of the world while those empowered to drive witches out of the villages have built mega churches in the cities. This results in overdose of anointing in a few areas while other areas are left untouched. Paul Enenche is a medical doctor trained in University of Jos, and married to Becky Enenche, also a medical doctor and both of them manages the church formed in 1996. This church has estimated 250,000 members in all their branches nationwide with about 25,000 in attendance at the headquarters attendance during their 5 services every Sunday but Enenche has millions of spiritual followers cutting across all denominations, especially people who have at one time or the other sat under his teachings and those who hook on too Dunamis TV for his ministrations. Paul Enenche deserves to be catalogued in this pastor's series because his is a peculiar brand of prosperity preaching which inculcates the spirit of responsibility and integrity in the pursuit of wealth. Many times in his church services he had cause to call on those with sinful materials or gifts obtained through wickedness to come out for alter calls and a lot of men surrendered cigarettes, condoms, money while women surrendered phones, watches, trinkets, money and even residential flats they obtained through immorality. Enenche also has a healing ministry. Many with debilitating diseases throng his church every Tuesday for the Healing and Deliverance Service and testimonies abound that persons with life threatening conditions including HIV, cancer, stroke etc. received healing after the service. There are evidences that he takes care of his pastors because most of them that started with him in 1998, are still with him, enjoying good measures of ministerial freedom and financial comfort. Beyond all these, Enenche has a peculiar trait in his messages which I have observed for over thirteen years. The central summary of his teachings is that every Christian must locate what God has called him to do and fulfill it. He harps it on his listeners to make meaningful impact in life by making the life of someone else better instead of base acquisition of wealth. He also reminds them of the eternity of heaven and hell. When the congregation has been tuned to being responsible for societal change, he initiates them into spiritual empowerment by prophetic releases which carry unction for recovery of stolen mandates. This subject of destiny fulfillment, from my Personal prophetic discernment, has three segments; Destiny Discovery which involves the ability of a believer to be aware of his mandate and how to cultivate an attitude and spiritual affinity that would bring it to pass. The second one is where a person is aware of his mandate but the pressures of life and hardship have caused the person to jettison Gods mandate as being unrealizable and untenable. The last is where the destiny has been stolen, exchanged, shortchanged, blocked, tied, and hidden. This could be as a result of sin, wickedness, occultism, spiritual manipulation and oppressions of witches and wizards who specialize in tampering with people's per-ordained destinies especially during the early days of birth. What churches actually term destiny recovery programme is nothing but poverty alleviating and success enhancement programme. A believer could be successful in the eyes of men without fulfilling destiny and they are in millions in Nigeria. Therefore, the destiny discovery and recovery ministry of Pastor Paul Enenche is one of the numerous assignments that God is reviving so that the displaced could find its bearing. This man's prophetic unction is for the purposes of backing the discovery and recovery with the divine force and power necessary for every God given assignment to become fruitful. Enenche submits to the spiritual fatherhood of Bishop David Oyedepo who visits his church almost annually, he also has affinity with Pastor Enoch Adeboye, but the central focus of his message is different from that of these two men. A combination of worship, healing, prayers, prophesy and revelational teachings is common place with him. He has discovered his area of core competence and is fulfilling it. He also operates Dunamis TV and occasionally organizes city wide crusades in Nigeria and Africa. The annual Glory Conference of Dunamis Centre which holds every November is about the most spiritually charged programmes in the city of Abuja and his Cross Over Night of every 31st December is the most popular cross-over night with massive turnout superseding any other in the city. Enenche have also found it difficult to tolerate politicians who mismanages public funds, and he not just lashes at them, he also galvanizes the congregation to pray against them. Conclusively, it is time for pastors to realize that the end time army according to Joel is an army that will not break their ranks; it is a focused army where each person is aware of his assignment. Until the church rises up to occupy their places of assignment, the day of the Lord may be constantly postponed. 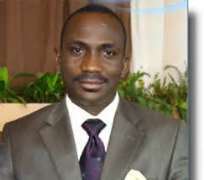 This generation that has become addicted to immoral music, movies and harmful social networks needs strong clarion call from apostles, prophets, teachers, pastors who will awaken them to the urgency of discovery, rediscovering, recovering and ultimately fulfilling their destiny and Paul Enenche is among those commissioned to undertake this task in an Apostolic dimension.